With utterly frigid conditions wreaking havoc on our neck of the woods—and the rest of the nation for that matter—the last thing we wanna think about is yet another cold season. But as Mercedes-Benz Fashion Week comes to a close, we can’t help but ogle over the fall 2015 styles spotted on the runways—especially the specs ‘n’ sunnies. 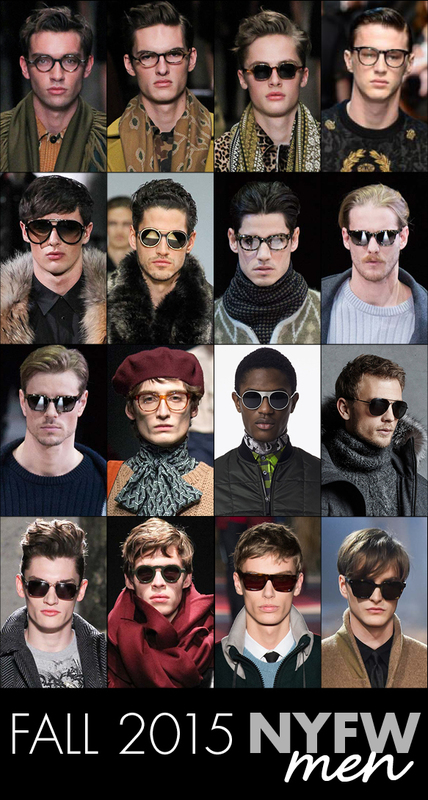 So take the plunge and jump ahead to impending chilly times by taking looksie at some of our fave frames, for gals and guys alike, seen on the catwalks below. Spexy babes can look forward to a somewhat neutral palette of navy blue, black, white, cream, amber and tortoise, with pops of eye-catching hues like cherry red, fuchsia, silver and orange. A slew of innovative silhouettes will run the gamut—think classic and streamlined cat-eyes, chunky squares, geometric-inspired profiles, perfect rounds, oversized shapes and more. Lots of alluring accents are also on the horizon—think metallic finishes, nature-inspired prints, layered effects, cut-outs, color blocking and browline emphasis, as well as colored and gradient lenses. Meanwhile, eyewear-lovin’ bros will enjoy darkened, gentlemanly pigments and patterns, such as forest green, black, tortoise, horn and slate gray, not to mention a mix of vintage- and futuristic-inspired shapes. Retro-like rounds, ovals and squares, as well as modernized aviators and rectangular profiles are on tap to be all the rage. To boot, an array of masculine elements—from flat-tops and flash lenses, to industrial embellishments and matte finishes—will most definitely be trending.